January 1 - The Portola Railroad Museum, in California, is reorganized as the Western Pacific Railroad Museum. January 3 - Officials with the Virginia and Truckee Railroad hold a "silver spike" ceremony in Carson City, Nevada, to commemorate the completion of two miles of track restoration near Gold Hill. Derailed VRE train on January 5. January 5 - A northbound Virginia Railway Express train on CSX tracks derails near Quantico, Virginia, as a result of a worn and chipped switch point rail. January 6 - China's railway minister Liu Zhijun announces a 160 billion yuan plan to begin more than 80 new railway projects, many of which are focused on high-speed rail services. February 20 - Chicago Transit Authority begins work on a capacity expansion project for the Chicago 'L''s Brown Line. The Tasmanian Government grants Derwent Valley Railway $60,000 to help them with their financial difficulties after the line was closed in 2005. Pacific National comes to a new agreement with the Tasmanian Government which included returning all tracks and rail lands to Government ownership, allowing restoration of service on the Derwent Valley Railway. 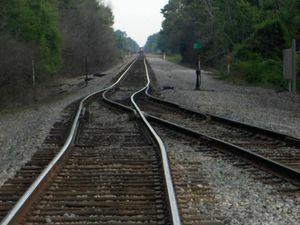 June 26 - Amtrak's northbound City of New Orleans passenger train encounters a section of misaligned track near Arcola, Louisiana; the engineer was able to slow the train enough that it did not derail as it traversed the misalignment. July 1 - Operations begin on the Qingzang railway between Golmud, China and Lhasa, Tibet. July 11 - A northbound Chicago 'L' Blue Line train derails in the subway between the Clark/Lake and Grand/Milwaukee stations in downtown Chicago; 152 of the trains almost 1,000 passengers are treated for minor injuries. November 20 - Women-only cars are introduced on the Tokyo Metro Tōzai Line to prevent groping. 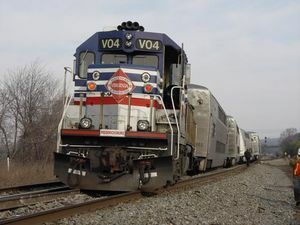 The Keystone Corridor in Pennsylvania is upgraded with two segments of 110 mph operation between Philadelphia and Harrisburg. Tomy introduces its second series of Thomas the Tank Engine wind-up toys. Killington Lane railway station on the preserved Lynton and Barnstaple Railway opens. ↑ Railroad Accident Brief: Derailment of Virginia Railway Express train near Quantico, Virginia January 5, 2006. United States National Transportation Safety Board (2006-11-20). Retrieved on 2008-01-05. ↑ Railroad Accident Brief: Operation of Amtrak Passenger Train Over CN Misaligned Track, Arcola, Louisiana, June 26, 2006. United States National Transportation Safety Board (2006-12-21). Retrieved on 2008-01-06. ↑ Railroad Accident Report: Derailment of Chicago Transit Authority Train Number 220 Between Clark/Lake and Grand/Milwaukee Stations Chicago, Illinois, July 11, 2006. United States National Transportation Safety Board. Retrieved on 2008-01-06. This page was last edited on 28 January 2012, at 23:52.